This hack is a ‘deluxe’ version of Final Fantasy II for the SNES. FF2US always felt somewhat lacking and incomplete but full of potential. This hack rectifies that by adding a ton of additions to the base game while keeping the majority of the main story intact and the feel of FF2US the same. 24 New Weapons! Including Ultima Weapon! 15 New Spells! Also revamped existing spells! New Equipment Screen with DETAILED buffs and stats!! New maps, new areas and new edits to overworld maps! New events! New enemies!! Sprint with the Y button!! New commands for characters. New Armors and Gears! Revamped shops/equipment and balanced their progression. Dark Knight Cecil now dual-wields and is 2-handed!! Edge is now buffed and very potent offensively! Rydia has also been buffed(slightly). It’s a surprise! Cecil has been buffed as a tank. Rosa can use more White Mage combative gears. Kain has new offensive buffing spells at end-game and new commands as he rejoins the team. Rare items and summons now drop much easier! This hack is designed as a ‘play-through’ without grinding. Many enemies now have meaningful rare drops, and all end-game enemies now have rare ultimate drops! New thrown weapons and back-row weapons! Lots of secrets that can lead to early acquirement of better equipment! Few minor tweaks to the base game such as save points, etc. Useless finds now replaced with good items or equipment! All weapons/armors used by characters no longer in party are now usable by at least one character from the end-game party! MOST items/equipment are now non-missable. Meaning they will be acquirable in some ways at end-game. Pinkpuff, vivify93, Fauntleroy, Yousei, chillyfeez, Grimoire LD, Myself086, b0ardface and Crow! Pinkpuff and Fauntleroy for their inspiration with Unprecedented Crisis and Golbez Edition. vivify93 for Project II. Pinkpuff for the ff4kster editor. Yousei for the FF4ed editor. chillyfeez and Grimoire LD for bug fix. Myself086, chillyfeez for SPRINT! b0ardface (http://ff4fe.com/) for attack power overflow fix. Crow! (https://www.twitch.tv/iicrowii) for the Equipment Screen mod (https://ff4-lunarianshuffle.blogspot.com/)! 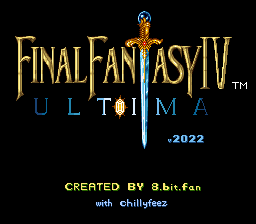 I hadn’t played Final Fantasy 2 / IV in a long while but it has always been a favorite of mine within the series (and all-time), I still have my cartridge for the SNES. I will preface the rest of my review: I was just around 22 hours of in-game clock to complete, which included a bit of rushing in certain parts but also completed just about all of the side quests and most item finding. The game starts out a little bit on the easy side of things (I kinda zoomed through here), and while familiar it doesn’t take long before you would notice the changes from the original, for those that know it. Maybe 2-3 hours in. The changes breathe some fresh life into an old game. As you progress further in, around 4-5 hours when your party starts to fill up it really starts to feel like a hack of a game you know, familiar but different. This is where I got hooked and pretty much binged the rest of the game. Hours 5-15 for me included some tricky spots, some upgraded enemies, the bosses are certainly tougher but not insane. The new and reworked spells, new weapons and armor etc. all flow very nicely into the game; nothing required, nothing OP either. When you reach ‘end game’ (I don’t want to give anything away) this was about hours 16 or 17 for me, this is when the game takes on another spike in difficulty. One I welcomed since I always thought the original was a bit too easy by the time you get there. And the game takes on another, nice level of ‘new’ as well. I could have spent a lot longer grinding and exploring this last section but my drive to get to the end was strong. Lots of new bosses here which will challenge even veterans, but they aren’t impossible, and there are hints for strategy along the way if you find them. If I was stuck or feeling under-powered, a bit of enemy slaying would yield exp and levels, as well as gold to buy upgraded equipment. All the new gears (and chars ability to equip), deserve a nod in their own right, this alone gave the game a nice new flavor. So I never felt truly stuck, and if you are clever (or sometimes patient) enough you can even get through tougher spots under powered, so there are not really any ‘level-checks’ which is nice as well. ***The one thing I would say, the in-game Battle Speed (Menu, Custom) is almost like a difficulty setting. I had trouble with a boss or two, slowed my battle speed down, and voila - victory. So just be aware if having trouble slowing things down can help a lot. *** I played on 1 fastest to start, slowed to 3 somewhere in the middle, and slowed to 6 for a couple boss fights but basically ran 3 for most of the game. All and all, this was excellent. I have played 50-100 different Megaman, Super Metroid, random, and of course Final Fantasy hacks. A very big thanks to 8-bit fan, the creator, who was extremely helpful and responsive to the inquiries I had along the way. This is an awesome hack! Play it!